It is possible that one could find a less biased review that the above quote by drummer and composer Bart van Gemert’s grandmother, but on the other hand it does describe the laudable aim of the Startas Orkester; making music with strong melodies and a clear concept, music that is able to satisfy the performer as well as the listener, music that bears repeated listening. 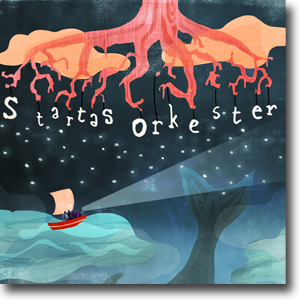 Norwegian predatory snails, the Dutch coastal town of Den Helder, and bonsai trees that have sadly passed away......these are just a few of the sources that Startas Orkester cinematic Indie Jazz draws its inspiration from. They name minimalist composer Steve Reich, alternative rock band Radiohead, Pulitzer Prize-winning American composer Henry Threadgill and jazz guitarist Kurt Rosenwinkel as major influences. Frans and I were immediately taken by the beauty of the music and the fresh and daring approach of these young masterful musicians. After a couple of takes they started working on ’’Noordhoren’’ and ‘’West Virginia’’. We then knew we had to have them on the Sound Liaison label. Having done a good take of each they asked if it was Ok to take a coffee break and if we liked the music. We were so overwhelmed with what we had just heard that we only answered with a yes. ‘’Is that a yes for the coffee or for the music?’’ one of them asked and then we all burst out laughing. It’s a yes, dear Startas musicians, for everything you stand for; the music, the passion with which you play and knowing that you are ready to carry the flame. The recording was done in 96kHz-24bit PCM.